show you ways to create something from the heart this holiday season. This 3 day Hop includes over 60 stops with inspiration brimming from every corner. 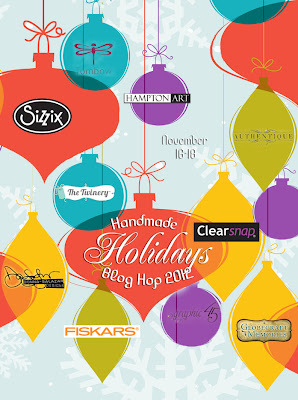 all in one place, during our second annual Handmade Holidays Blog Hop! To sweeten the Hop, we’re offering a gift for you! a prize pack from one of the participating manufacturer sponsors! I'm so very thrilled to have you visiting my blog today. I have an entire list for today's hop at the bottom of this post. Alrighty, are you ready to meet him? Authentique Paper's Peaceful Collection, bits of ribbon, trim and old buttons! and an elegantly shaped paper mache ornament (for the head and hat). tip for the nose after painting it a bright pumpkin orange. For the eyes I simply punched two small 1/4" circles and placed them on with foam dots. rounded part of the ornament with Mod Podge. I found it best to fold the strips lengthwise before attaching. crystal fine glitter to the paper. with a pretty black trim that I had in my stash. ends of the paper didn't meet, I made a placket from Peaceful's "Chill" Paper. This same paper also acted as the collar for the lid of the round box. and the base of the collar. the head. This helped to hide the uneven edges of the paper strips. I started out thinking sticks. Way too spindly looking for Mr. Snow and his girth! into place. You will want to make two of these of course. I used a 2.5" Styrofoam ball and cut it in half. After glittering, I tucked it into the opening of the cone. You will want to use a very thick craft glue for this especially. Peaceful Details 12x12 Sticker Sheet. I added a few felt snowflakes with black button centers. the Peaceful Elements 12x8 Sticker Sheet. styrofoam hands with large corsage-style straight pins. Now, admit it...he's just a doll, isn't he? Thank you so much for letting me share my excitement for him with you! so generously given in the spirit of all things handmade. Enjoy...and may you have a beautiful handmade holiday! what a brilliant project - your snowman is just so much fun and would make a great centrepiece -thanks for sharing. WOW - your new man looks fabulous!!! Mr Peaceful Snow is pretty fabulous!! Awesome project Shellye!! Your snowman is so adorable! Nice to meet you Mr. Peaceful Snow! He really is handsome! And so creative! 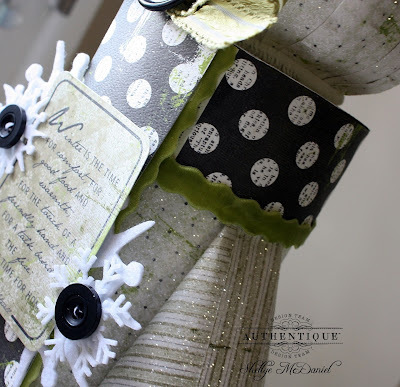 I love the twine hands! Oh how cute, I never would have guessed the items you altered to make him. What is there to say about this project but..WOW oh WOW! Stunning! OH WOW!! I just love it. I could write all of this comment in caps, but I don't want to sound all angry. Simply beautiful and very unique. Thank you for sharing! 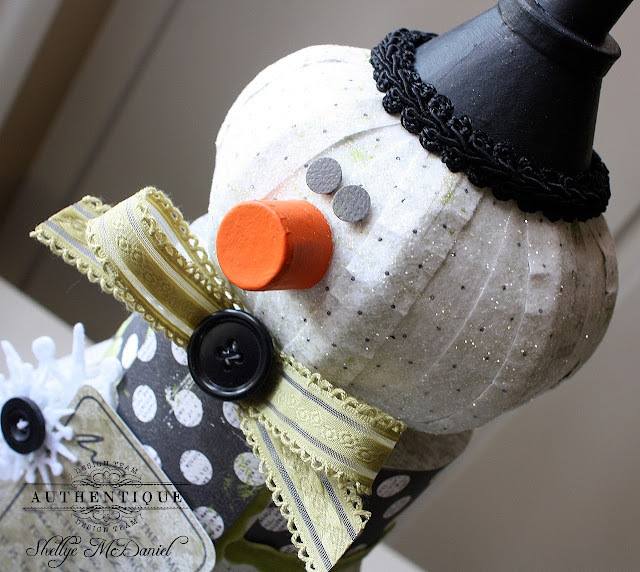 Your little snowman is fabulous! Another snowman for my collection! Love it! Oh my gosh Shellye, your snowman is adorable. I love that when you look at him he sparkles from the glitter like fresh snow does. I have to try to make him. 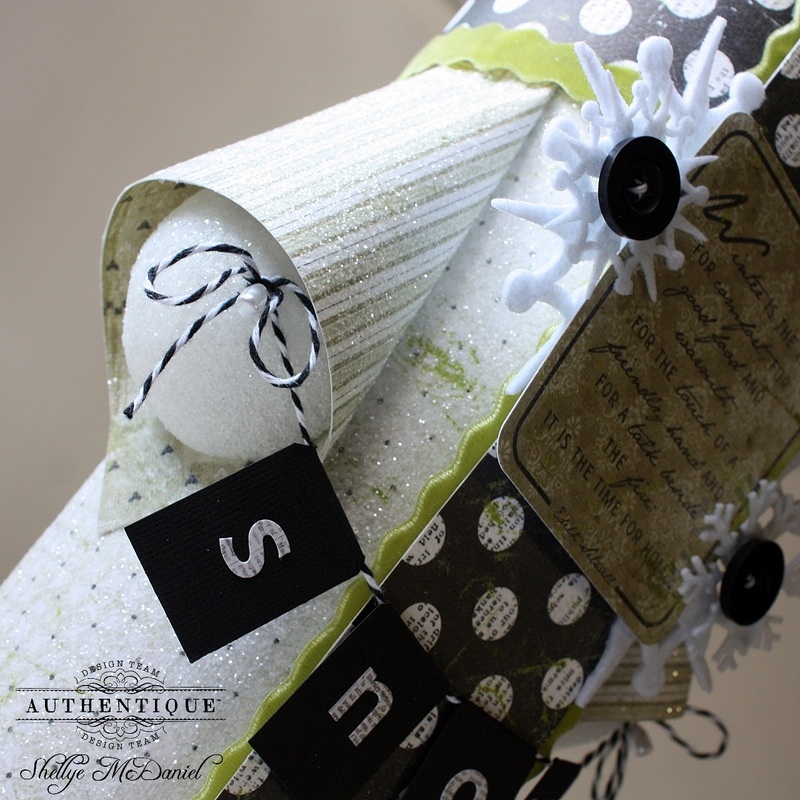 I love the paper you used from Authentique...it is one of my favorite lines this season. He looks like you had a grand time bringing him to life. Thank you for sharing. The snowman is sooooooooo adorable. Oh my goodness!!!! 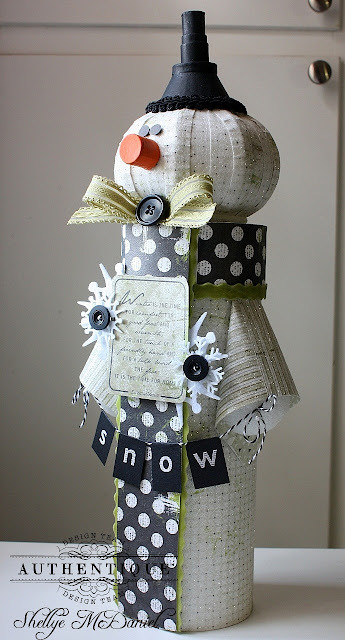 Amazing snowman, I love all your details! You go girl!! How cute he is! Thanks for sharing. Oh my, I love this! What an adorable snowman, thanks for sharing him. Stinkin' adorable! I have a big ol' grin all over my face! So cute! I love your snowman! Very clever and unique. Amazing, very adorable project - thanks for sharing! He's my favorite project today! WOW! What a super awesome snowman!! You're so creative!!!!!! You really rock! Your Mr. Snow is adorable. one word = "A D O R A B L E". Thanks so much for sharing this fellow - just when you think you've seen every snowman project - then there's something like this. Inspires me to stretch my creative muscles (and makes me a little jealous that I can't come up with stuff like this - lol!) - thanks again! Wow, just wow!!! That is the coolest snowman. Thank you so much for sharing him. What a sweet adorable snowman you have created just so cute. Thanks for sharing him. WOW! He is super awesome! Great job! Clever, clever, clever. What a sweet face he has. He is amazing! A very handsome snowman to be sure. Thank you. ..Mr Snowman has a look of trouble in his eye.. LOL Just so darned cute.. thanks for the idea.. Very fun project! Love the snowman! All I can say is wow! I love the fantastic snowman! What an adorable snowman! Great idea. this is one of the most adorable snowmen I have ever seen. what a great project. and a beautiful tabletopper / centerpeice. thank you for the inspiration. Mr. Snow is just adorable! I am amazed at all of the bits and pieces you used to put him together. Thanks for sharing your talent with us. Congrats on the new man in your life. May your relationship be a long and happy one! Thank You for introducing us to your new man. He is adorable! I want to make this... it is too cool..
OMG !!! 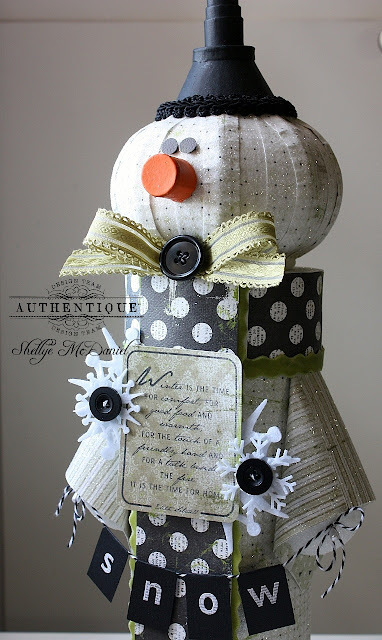 snowmen are my favorite decoration for Christmas and Winter. This one is especially adorable ! Sweet! I can't believe how adorable this snowman is. /going to copy the how-to and give it a whirl... tfs! 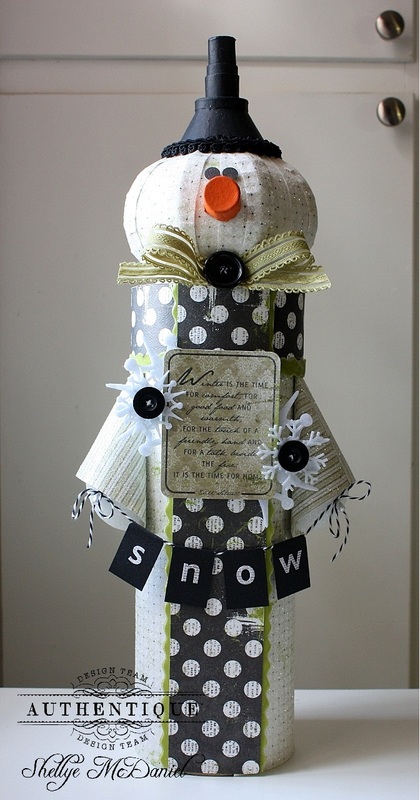 Your snowman is really cute and is great for winter home decor. TFS! OMG, I laughed when I saw the first pic of Mr. Peaceful Snow! He is just too precious for words. You did a great job, and now I have to make me one! What a fun snowman! Thanks for sharing! I do like your new man - he's one cute guy....very creative...good job. What a awesome project! he is so cute! Thanks for sharing how to create him!! 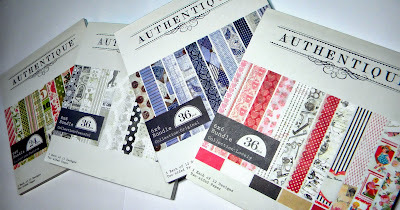 I can't wait to try this - running out for some special papers now! You had some creative juices flowing that day!!! Very well done! just adorable! i love him! 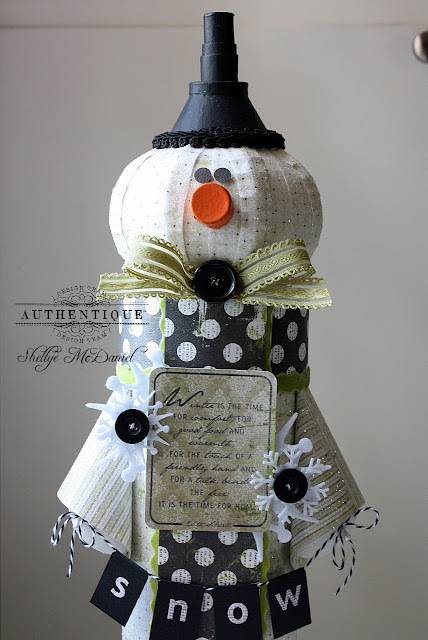 I'm simply in love with your amazing mr. Snowman! Sooo beautiful! 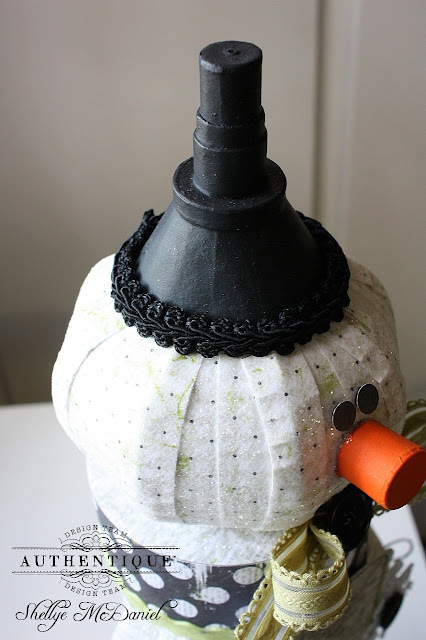 Can a snowman look regal? Yep! He's adorable! He is so cute! Right down, or up, to his cute little Fiskars Orange nose! OMG too cute your snowman is AMAZING !!! Everything has been so beautiful!! What a fun project! He is cute! SHUT THE FRONT DOOR!!!!!!!!!!! This could not be cuter, or more amazing. You should sell these.. I would totally buy one! He is sooo cute! What a fabulous decoration! He is just too cute! I LOVE how you pulled all those different elements together! the effect is just fantastic! This is just too cute! Excellent job, love your thinking out of the box, you Rock!!! O M G he is the cutest! I love how you put him together so creatively. Nice hat! Beautiful project. Hugs, Susie. I love Mr Peaceful Snow!! How cute! Wow! I love all the little details that went into creating this cute little guy! What a super cute idea! :D this guy is so handsome!!!! What a fine looking fella! What a cute idea, thanks for sharing. This is an amazing snowman, just amazing. Thank you so much for sharing.